Fairfax, VA – Aug. 1, 2016 – Paradigm Benefits (aka HR Benefit Advisors, Ltd.), an independent, employee benefit advisory firm based in Rochester, NY, has become an affiliated partner of Trailways Transportation System, Inc.
Its 16-member team of associates serves clients in transportation and many other industries, not only in New York State but also across the United States. Paradigm Benefits is able to bring Fortune 500 solutions to small and midsize employer groups. Paradigm Benefits experts start with an in-depth understanding of each client’s employee benefits needs, goals and challenges. Then they either assess the client’s existing benefits program or develop a custom benefits program for the client. Is it feasible for our company to self-fund our benefit claims? Which Web-based, employee benefits enrollment and management system (HRIS system) will save us the most administrative time and money while giving us convenient access to all the data we need? How can we incorporate a wellness program, population health management and disease management into our employee benefits program to keep our employees healthy, to reduce our risks and to control our company’s health-care costs? Which retiree medical plan options would enable us to reduce our liabilities? How do our 401(k) plan fees compare with market norms? What do we need to know about COBRA, HIPAA, DOL and ERISA compliance; about GINA, CHIP, IRC Section 125 cafeteria plans, Medicare Part D? How does the Affordable Care Act impact our company? Founded by principals Michael Colao and Gary Mink as HR Benefit Advisors in 1993, Paradigm Benefits has an office in Utica, NY, in addition to its Rochester headquarters. Paradigm Benefits gains leverage in the marketplace as a charter member partner firm of United Benefit Advisors® (UBA®). The UBA® alliance comprises more than 2,000 professionals in 140-plus independent, benefit advisory firms in North America and the United Kingdom. The combined financial resources of UBA® firms enable them to obtain competitive rates, superior technology tools, plus enhanced products and services. “Taking care of employees is just as vital as taking care of the vehicles in the Trailways fleet,” said Ron Moore, Trailways Chairman. “Employee benefits play an important role in recruiting, retaining, rewarding and gaining peak performance from the thousands of employees working for Trailways stockholder companies. We’re pleased to welcome Paradigm Benefits as an affiliated partner that can help our Trailways companies to navigate the complexities of employee benefits program design, administration and regulatory compliance,” he said. Manfredo added, “We exist to make the lives of our clients easier by removing the headaches associated with administering their employee benefits programs.” Through its “Benefit Sync” model, Paradigm Benefits consolidates enrollment and billing services, delivering all charges from multiple carriers on a single bill. Benefit Sync also includes an Employee Service Center hotline. Credentialed hotline staffers such as registered health underwriters and certified employee benefit specialists answer employee questions, resolve problems and report results to the client. Trailways Transportation System, Inc. (Trailways®), founded in 1936, is composed of 65 independently owned or managed bus and motorcoach companies based throughout North America and parts of Europe. Each company adheres to the highest safety standards as required by the United States Department of Defense (DOD) or its country’s equivalent. Trailways drivers operate a wide variety of more than 12,000 passenger transportation vehicles. Through the more than 100 companies in its Affiliated Partners Program, Trailways maintains a close working relationship with industry-related suppliers and vendors, as well as other tour and travel service entities. Affiliated Partners are listed on the Trailways portal http://www.teamtrailways.com. Fairfax, VA – April 26, 2016—Fortress Systems International (FSI), Inc., a company providing information technology services and solutions to improve safety and security in the transportation industry, has joined the Trailways Transportation System, Inc. (Trailways), as an affiliated partner. “FSI designs, develops and distributes mobile surveillance solutions that are affordable, easy to use and scalable, in addition to surveillance systems for buildings and residences,” said Frank Bowden, FSI Vice President of Sales. “Our mobile video security solutions are designed to improve safety and security; to reduce vandalism, liability and litigation due to false claims; to improve response and reaction time to passenger incidents; and for real-time, live monitoring of passengers. FSI also offers the SureBus fleet management solution to increase operational efficiency and accountability. Cloud-based on the World Wide Web, SureBus is designed to integrate with a customer’s entire business, from logistics and maintenance to payroll and dispatch. It provides data helpful in reviewing actual performance against safety benchmarks and charting progress. 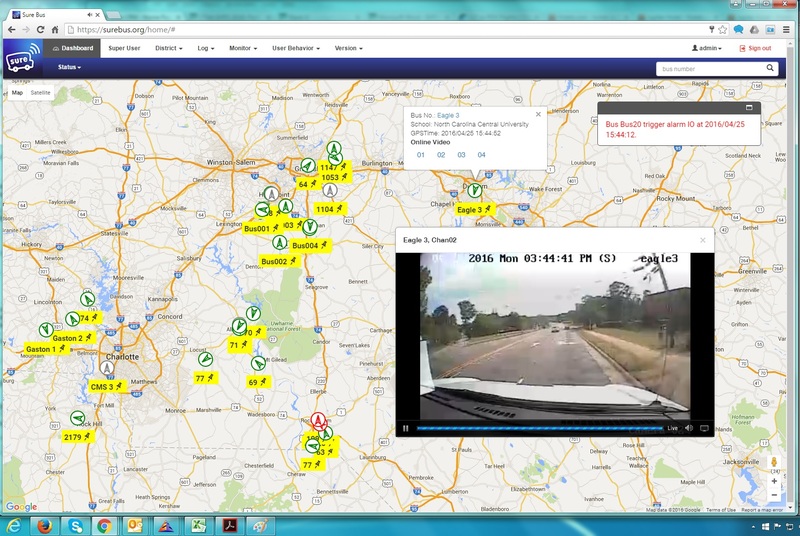 SureBus includes GPS fleet tracking; real-time monitoring of passengers, drivers and fleet assets; instant notification of key events such as unauthorized vehicle activity; and reports on fleet performance from as few as two to as many as 10,000 vehicles. From anywhere with an Internet connection, a fleet manager can use SureBus for making scheduling decisions such as adding drivers or setting routes. The SureBus communication features enable the sending of bulk notifications and messages to dispatchers and drivers. These features also allow passengers and designated others – such as parents waiting to pick up their children at a school bus stop – to track a vehicle in real time via a mobile device. FSI serves the motorcoach, school bus, public transit, paratransit, taxi/limousine, first responder, trucking and law-enforcement markets. Headquartered in Charlotte, NC, the company also has an office in Shenzhen, Guangdong, China, for its programmers, research and development staff. “Fortress Systems has a history of working with small entrepreneurs, Fortune 500 companies, educational institutions and local and state government agencies, including hundreds of school systems throughout the country,” said Trailways’ Chairman, Ron Moore in welcoming FSI to Team Trailways. To enhance student safety, Fortress Mobile offers an ultra-high-definition, stop arm camera system for school buses. Its 1080-pixel/720-pixel imaging can capture key evidence to identify an offending motorist violating the stop arm. Information captured by the video and audio recordings, GPS and sensory data in FSI’s surveillance systems can be retrieved, viewed, saved and shared, via Wi-Fi or cellular technology, as either still images or video clips. The system includes a “facial masking” capability to protect the privacy of passengers. For some of the products in its IT solutions, FSI partners with other technology companies. It is a Microsoft Gold Member, HP Business Partner and Warranty Center, Lexmark Warranty Provider, Brother Repair Center, Milestone Business Partner, Ingram Micro Service Provider, Sharp Partner and Intel Premiere Provider.